In celebration of George Washington University's Washington Writers Archive Collection, 10 poets who have donated their papers to the Collection took over GWU Gelman Library Thursday night, April 28, 2016 to read wondrously to an avid audience. The event was designed to showcase the magic diversity of poetic talent in the greater DC area and, in so doing, to klieg-light the Archive Collection holdings as a rich resource for research. The DC area is a special treasure trove of poetic talent. In recognition of that gold wealth of voices, the Gelman Library decided a few years ago to create a Washington Writers’ Archive Collection that would hold for posterity the papers of area poets. The Collection’s intent is to showcase and focus on the interaction between and within the community of DC area poets – how we have influenced and impacted one another. How we have boosted our voices collectively. Currently, the collection contains the papers of about 30 individual poets or poetry organizations. Jennifer King, Special Collections Librarian at the GW Gelman Library, can provide more information about the collection – its current inventory and its future plans. The Collection is designed and intended to be used. To be used by researchers, by the public, by poets, by anyone interested in the roots of our collective poetry efforts. It’s a collection that doesn’t want to collect dust – it’s eager to be studied and enjoyed by any and all so that the public better understands how area poets have touched each others’ lives, and how as a group, we’ve influenced life in the greater DC area. The photo above was taken just after the reading. 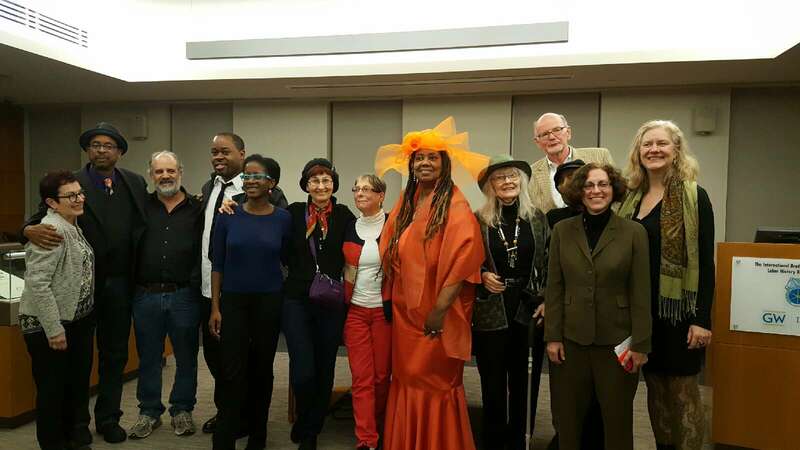 From left to right are poets Beth Baruch Joselow, E. Ethelbert Miller, Cliff Bernier, Patrick Washington, Holly Bass, Karren Alenier, Grace Cavalieri, Sylvia Dianne "Ladi Di" Beverly, Judy McCombs, and at the far right, Sarah Browning. Jennifer King (second from right) with the Library's Special Collection helped organize and host the event. Hidden behind her is Sydney March who played his magical flute during the evening. Ladi Di and the tall bald guy (Hiram Larew) on the back row emceed the event. Holdings from the Archive Collection are on display at the Library through mid-May. And the program was video recorded by poet Jesse Alexander. Lots of younger folks attended the April 28th reading along with fine DC-area poets like Miles David Moore, Sistah Joy Alford, Jacqueline Jules, Laureen Summers, Quasar, Andre Brenardo Taylor and many others. All in all, it was a might fine evening. Maybe, even historic.